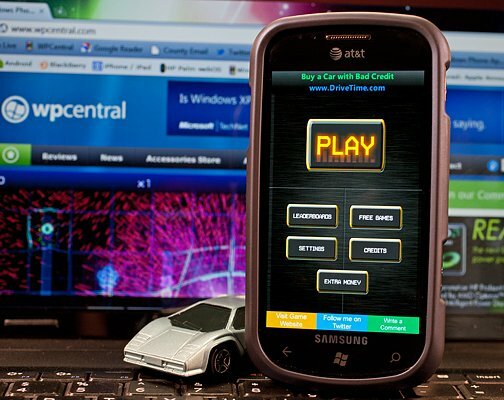 Elbert Perez has developed his fair share of Windows Phone games. From Steam Castle to Impossible Shoota to Traffic Cop, his efforts have produced some interesting, entertaining games. One of his latest titles, Armored Drive, continues in this tradition. It's a road race, dodge traffic and balls falling from the sky type game. It reminds me of a Spy Hunter game or Steel Avenger but unique enough not to feel like "just another road game where you have to dodge traffic and fight off the enemy". To read more on Armored Drive, zip on past the break. From the Main Menu of Armored Drive, you can access the game, online leaderboards, settings (music, sound, and tilt sensitivity), get a little extra money (one time only), as well as links to other games by Perez and credits. Before you enter the game screen, you are given a chance to purchase upgrades for your car. Upgrades includes adding armor, engine upgrades, paint jobs, as well as a wide variety of weapons. As you play the game, you'll earn cash (basically one dollar for every point scored) that can be used to purchase these upgrades. The game play screen has your score and speed listed at the top of the screen. The goal is to maneuver your car up the five lane highway, dodging on coming traffic and avoiding enemy vehicles, bombs and the occasional pot hole. You control your armored car by tilting your Windows Phone left or right. The longer you survive, the faster you go. At some point, the enemy rears it's ugly head and starts attacking you by various methods that include dropping bombs from a helicopter and appearing from the bottom of the screen shooting at your from cars. To add to the challenge, there are various roadways that includes your traditional black top highway, a cobblestone roadway and a dirt road. Some have marked traffic lanes while others don't. Once you crash, your points are converted to dollars and banked. 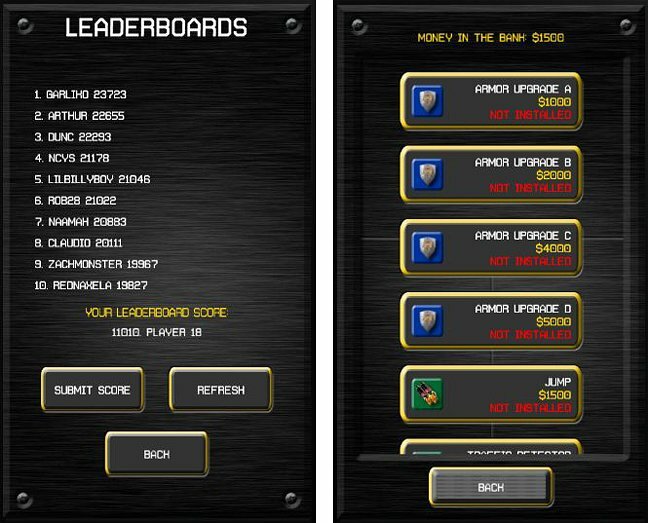 You have the option to return to the game, check out the leaderboard, go back to the main menu or purchase upgrades. While Armored Drive is reminiscent of other "Spy Hunter" games, it's unique enough not to feel repetitive. I like that the concentration is to dodge your way through traffic and the ability to improve your vehicle's chances through the various upgrades. There is a slight addictive quality to the game and it ran smoothly with no crashes, bugs, or glitches experienced. The graphics were nice and had a semi-retro feel to it. The only thing missing is a little Peter Gunn music playing in the background. 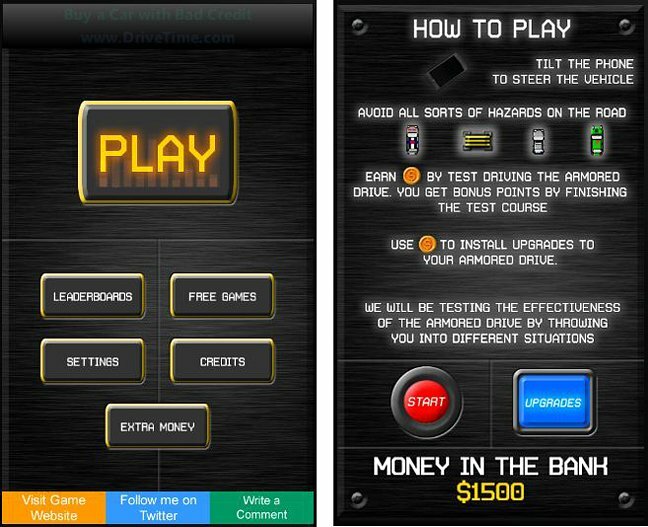 Armored Drive is a free, ad supported game and a nice addition to the Windows Phone game lineup. You can download Armored Drive here (opens Zune) at the Marketplace.